We are pleased to announce that all of our plugins have been upgraded to support JW Player version 7. With JW Player version 7 comes improvements in appearance and performance. One important change to be aware of is that everyone who uses the version 7 player is required to register for a license. However, the great news is that JW Player have changed their entry level to be free for anyone to self publish. There is no longer any restriction mentioned regarding commercial verus non-commercial, licensing is based on the number of websites you ned to run the player on as well as what additional functionality you require such as serving Ads for example. 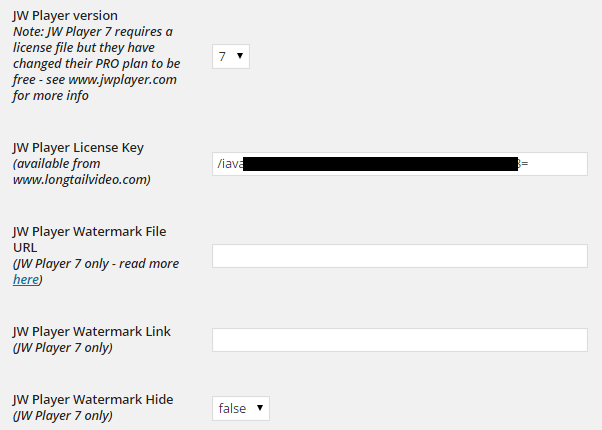 To configure JW Player 7 go to your HSS plugin settings in your WordPress admin dashboard and select 7 from the dropdown.